Pets Best Insurance Services, LLC, a leading U.S. pet insurance agency, has announced the launch of its first Books & Barks contest. Pets Best developed the contest to promote the benefits associated with utilizing therapy dogs to assist students in classrooms across the nation. Pets Best invites therapy pet handlers and organizations, students, and educators to submit inspirational stories about therapy dogs in classrooms and the positive effects they have on students. The winning class or school will receive $1,000 from Pets Best for classroom supplies. In addition, Pets Best will offer a $500 donation to the therapy dog handler’s favorite animal-related nonprofit organization. 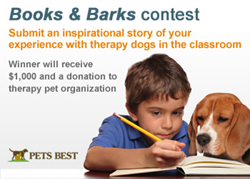 Representatives from therapy dog organizations, students, and educators can enter the contest by visiting http://www.petsbest.com/forms/books-and-barks-contest. Submissions should include a short essay of 250 words or less. A judging panel comprised of representatives from Pets Best will select finalists from the submitted entries based on their unique experiences and heartfelt stories. The public will then have a chance to vote online for their favorite submissions. The submission deadline is Aug. 31, and online voting will take place from Sept. 8 to Sept. 25. Therapy dogs are trained to provide affection and comfort to people in a broad range of settings, including hospitals, retirement homes, and hospices. They are increasingly used in schools and educational programs to help reduce stress among students and promote a comfortable learning environment. Children often experience a host of benefits when therapy dogs are incorporated into the learning process, said Dr. Lisa Miller, a licensed therapy dog handler who serves as a pediatrician at Good Night Pediatrics in Henderson, Nevada. Miller and her Labrador retriever, Taonga, volunteered for several years with Paws to Read, a program in Reno, Nevada that uses therapy dogs to teach children how to read. For more information about the Books & Barks contest, visit http://www.petsbest.com/blog/books-and-barks-contest. Dr. Jack L. Stephens, president of Pets Best, founded pet insurance in the U.S. in 1981, with a mission to end euthanasia when pet owners couldn’t afford veterinary treatment. Dr. Stephens went on to present the first U.S. pet insurance policy to famous television dog Lassie. Pets Best provides coverage for dogs and cats, and is the only veterinarian founded and operated pet insurance agency in the United States. Dr. Stephens leads the Pets Best team with his passion for quality pet care and his expert veterinary knowledge. He is always available to answer questions regarding veterinary medicine, pet health, and pet insurance. The Pets Best team is a group of pet lovers who strive to deliver quality customer service and value. Visit http://www.petsbest.com for more information. Pet insurance coverage offered and administered by Pets Best Insurance Services, LLC is underwritten by Independence American Insurance Company, a Delaware insurance company. Independence American Insurance Company is a member of The IHC Group, an organization of insurance carriers and marketing and administrative affiliates that has been providing life, health, disability, medical stop-loss, and specialty insurance solutions to groups and individuals for over 30 years. For information on The IHC Group, visit: http://www.ihcgroup.com. Additional insurance services administered by Pets Best Insurance Services, LLC are underwritten by Prime Insurance Company. Some existing business is underwritten by Aetna Insurance Company of Connecticut. Each insurer has sole financial responsibility for its own products.